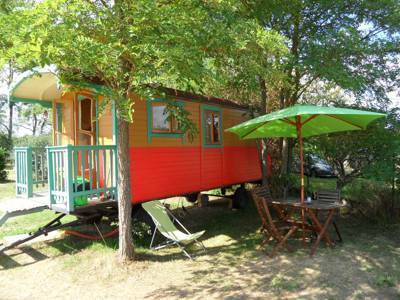 A colourful restored gypsy wagon that’s perfectly placed for exploring France’s Auvergne region. In this quiet and peaceful part of North Auvergne, the Domaine du Bourg is a beautiful and tranquil setting, ideal for relaxing or enjoying time with the family. This beautiful gypsy caravan is equipped with a big outdoor living space with BBQ, an awning with a dining table and deck chairs. Inside there is a bedroom with a double bed and a living / dining area with a sofa bed and open-plan kitchen. The caravan is fully equipped including a stove, kettle and fridge/freezer.Bed linen is not provided. Please add this is an additional extra or please bring your own. NB: The capacity of the caravan is for a maximum of 3 people, but we allow you to book for up to 2 extra children if you bring your own tent (and bedding) to pitch next to the caravan. If you do not plan to bring an extra tent, please limit your booking to 3 people. The Domaine offers plenty to do for the little ones or big ones alike from a Volley-Ball pitch, to a petanque area, swimming pool, trampoline and sandpit and swings. A communal BBQ area with picnic tables, together with a bakery 50m down the road, and a butchers and further shops and cafe down the road will allow you to enjoy local produce without venturing too far afield. Local activities include kayaking on the Loire and idyllic bike rides, not to forget the beautiful and historic towns which are a must-see in this area.